New product releases tend to garner most of the headlines at trade shows—and for good reason, with brands unveiling their latest gear and retail buyers searching for items that customers covet. But SGB wanted to know more about the exhibiting companies than merely their latest camping goods, footwear, apparel or accessories. 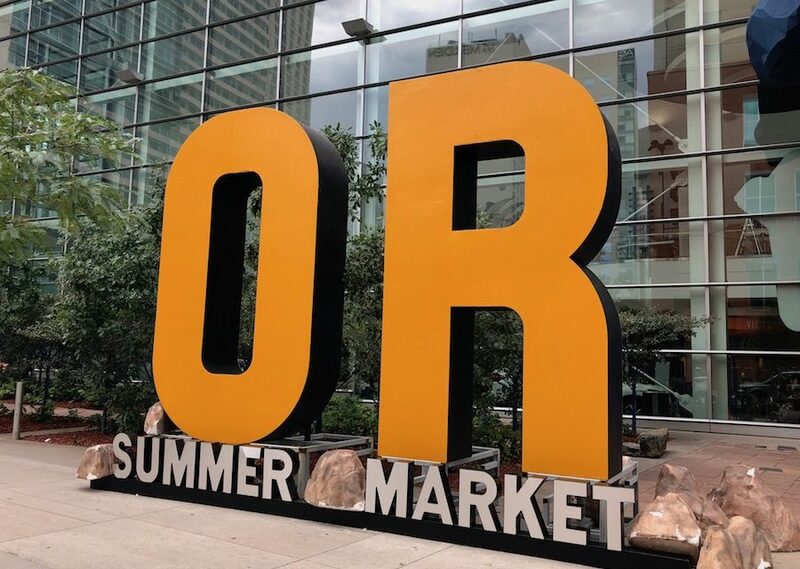 So our editorial team visited dozens of booths at last week’s Outdoor Retailer Summer Market in Denver, CO, to uncover what’s happening with brands beyond their spring/summer 2019 releases. We discussed a wide range of topics that included companies’ marketing efforts, channel strategies, M&A activity and other stories that weren’t immediately apparent to passers-by. Here are a few highlights culled from this reporter’s notebook, including some brand stories and industry trends. Look for more reflection on OR and more details on some of these stories in coming weeks. “Demo Experience: The Urban Adventure” kicked off Outdoor Retailer Summer Market with booths at Confluence and Commons Parks and paddlesports demos that allowed retail buyers to take kayaks, floatables and SUPs onto the Platte River. But the new venue drew mixed reviews from attendees. The proximity of demo day to the show was a plus, as were the free pedicab rides that allowed for an easy trip to the Demo Experience from the Colorado Convention Center, but low water due to drought in Colorado somewhat limited the full paddling experience, and afternoon thunderstorms forced many exhibitors to start packing up early. Off the record, some paddlesports companies said they hoped Outdoor Retailer moves the demo day to an area lake without severe water level problems. Even if a new, away-from-downtown locale required more complex transportation logistics, it would allow a better kayaking and SUP-ing experience, they said. While the Demo Experience wasn’t quite the success paddlesports companies hoped it would be, they had plenty of visibility and traffic on the trade show floor. Hemisphere Design Works was making its debut at Outdoor Retailer, even if the company’s flagship brand, Evoke, has been around for a while. HDW, based in Muskegon, MI, is the new name that arose out of the 2017 merger between KL Outdoor and GSC Technologies. The 500-employee company is co-owned by its management team and New Water Capital Partners. Wes Mooney, the company’s vice president of sales, marketing and product development, reiterated to SGB what he and President Chuck Smith said for a May feature on the company: HDW is poised to make a splash in the outdoor and paddlesports specialty retail channel with Evoke. Look for more on the paddlesports category in coming weeks, including news from Hala Gear and Red Paddle Co. and a Q&A with Confluence Outdoor VP of Marketing Todd King about the state of the industry. Two acquisitions were announced during OR, including SGB’s exclusive interview with Exxel Outdoors leaders discussing the company’s recent purchase of luxury backpack brand Hex. Exxel Outdoors formally acquired Hex on June 1, and while the companies didn’t announce the deal publicly until Outdoor Retailer, Exxel carved out a space in the company’s trade show booth for some of Hex’s products, cluing in show attendees to Exxel’s new portfolio addition. The other big acquisition announcement came on Wednesday of OR, when Swiss apparel brand Mammut Sports Group AG officially released details of the brand’s acquisition of digital platform Mountain Hub. Mammut’s North America CEO Joe Prebich and Mountain Hub co-founder Brint Markle spoke at length with SGB before and during OR about the deal, the terms of which were not disclosed. The acquisition brings Mountain Hub—which Markle calls the “Waze of the outdoors”—into the Mammut family, where the brand can nurture the app and expand its audience. And some of Icebreaker’s leaders—including Luke Doddrell, GM for North America; Trudie Abel, head of marketing for North America; and Lynnette Stiger, head of global business units—discussed the brand’s recent acquisition by VF Corp. Look for much more on this in a future SGB article. The 1960s and 1970s were a popular era for launching outdoor brands, as evidenced by the anniversaries being celebrated at OR. Royal Robbins is turning 50 this year, and while the company is undergoing plenty of change thanks to its new owner, Fenix Outdoor, the vision of the company’s namesake and founder—who died last year—remains intact. Mountainsmith is another brand with a milestone anniversary this year. The Golden, CO-based backpack and accessory company is celebrating its 40th anniversary, which included a new collection. Look for a Q&A with the company’s president, Jay Getzel, in coming days. And while Sierra Designs turned 50 a few years ago, the company’s California Collection is a nod to its roots, even as Sierra Designs starts to gain traction under new leadership (VP/General Manager George Bryant, who was appointed in November) and relatively new ownership (Exxel Outdoors, which acquired American Rec in 2015). Private equity firms and investment banks were in full force at the show, and a happy hour with some of them revealed concerns about the industry, including the razor-thin margins that companies are generating as well as perceived homogeny and lack of product innovation across categories. True, plenty of brands have the backing of large parent companies like VF Corp., Wolverine World Wide, Fenix Outdoor, Amer Sports, Exxel Outdoors, Cascade Designs, Newell Brands and others, but many continue to seek private backing or other avenues such as crowdsourcing. However, while the industry isn’t as profitable as, say, technology, brands continue to thrive and draw the attention of investors. Many have found a niche that helps them operate at a profit, however small. Financial insiders told SGB the industry needs to find new ways to innovate and new channels to explore before getting infusions of investment. Sustainability was a common theme among brands, with companies like Gore-Tex working to produce performance material that is gentler on the earth. In the coming days, look for a Q&A that SGB conducted with Bernhard Kiehl, Gore Fabrics sustainability leader, about the company’s current sustainability efforts. The outdoor specialty channel remains a priority for brands who exhibited at OR, and while some are venturing into places like Target and Walmart, the mom-and-pop shops remain a viable outlet. Some brands are even doubling down on the brick-and-mortar channel, such as premium men’s wear company Fisher + Baker, which is finding more success with men’s fashion retailers than online channels can offer. Technology is playing an even greater role in the design and development of products, including Cascade Designs’ $200,000 mannequin, “Hugh,” which helps the company test R factor for insulation in its products, PR manager Jennifer Curto told SGB. While all companies are focused on the top and bottom lines, some are using their giving back initiatives to increase brand value and align with their founding principles. SGB talked to a host of companies that are donating product or volunteer time to various causes, including LifeStraw, MSR, Klean Kanteen and BioLite. The large brands with multiple-story booths at Outdoor Retailer tend to dominate the photos and headlines in the consumer and even trade press, but the event remains a place where startups can gauge interest in product and see if there’s a fit for retail channels. For example, Folding Boat Co. out of North Carolina shared some booth space with other brands based in the state. The company’s founder, Pete Flood, said the goal was to expose his packable kayak to as many retail buyers and media outlets as possible. Look for much more coverage from Outdoor Retailer Summer Market’s Denver debut in future editions of SGB Executive, including Q&As, product trends, brand stories and more insight into the outdoor industry’s future. And feel free to send your brand’s business news to ericsmith@sportonesource.com. Eric Smith is Senior Business Editor at SGB Media. Reach him at ericsmith@sportsonesource.com or 303-578-7008. Follow him on Twitter or connect on LinkedIn.